Raphael was born in Urbino, a central Italian duchy noted for its elegant gentility and Renaissance scholarship. He moved to Florence toward the end of 1504. 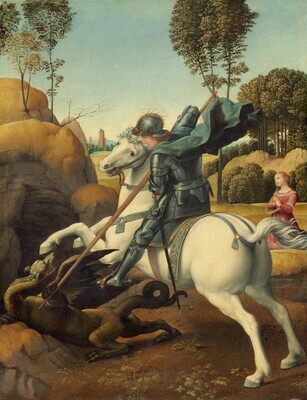 Saint George and the Dragon, one of two versions of the theme by the artist, belonged to a series of miniature panels that Raphael painted in Florence for the celebrated court of Urbino. A Roman soldier of Christian faith, Saint George saved the daughter of a pagan king by subduing a dragon with his lance; the princess then led the dragon to the city, where the saint killed it with his sword, prompting the king and his subjects to convert to Christianity. One unusual feature of the painting is the saint's blue garter on his armor–covered leg. Its inscription, HONI, begins the phrase Honi soit qui mal y pense (Disgraced be he who thinks ill of it), the motto of the chivalric Order of the Garter, of which George is the patron saint. Duke Guidobaldo da Montefeltro of Urbino was made a knight of the prestigious order in 1504 by King Henry VII of England. Scholarship has shown that the panel was made for the king's emissary, Gilbert Talbot, and not as a gift directly for the king, as was previously thought. William Herbert, 3rd Earl of Pembroke [1580-1630], Wilton House, Wiltshire, by 1627; possibly his brother, Philip Herbert, 4th Earl of Pembroke [1584-1649/1650], Wilton House; given either by the 3rd Earl or the 4th Earl between 1628 and 1639 to Charles I, King of England [1600-1649]; (Charles I [Commonwealth] sale, Somerset House, London, 19 December 1651); purchased by Edward Bass. Charles d'Escoubleau, Marquis de Sourdis [d. 1666], possibly acquired from Bass. Laurent Le Tessier de Montarsy, by 1729; Pierre Crozat [1665-1740], Paris, by 1729; by inheritance to his nephews, first to Louis-François Crozat, marquis du Châtel [1691-1750], Paris, and then [on Louis-François' death without a male heir] to Louis-Antoine Crozat, baron de Thiers [1700-1770]; the latter's heirs; purchased 1772, through Denis Diderot [1713-1784] as an intermediary, by Catherine II, empress of Russia [1729-1796], for the Imperial Hermitage Gallery, Saint Petersburg; purchased March 1931 through (Matthiesen Gallery, Berlin; P. & D. Colnaghi & Co., London; and M. Knoedler & Co., New York) by Andrew W. Mellon, Pittsburgh and Washington, D.C.; deeded 30 March 1932 to The A.W. Mellon Educational and Charitable Trust, Pittsburgh; gift 1937 to NGA. Recorded in Van der Doort, A Catalogue and Description of King Charles the First's Capital Collection of Pictures, Limnings, Statues, etc, from an Ashmolean manuscript (c. 1639), prepared for press by G. Vertue (printed by W. Bathoe), 1757: 4. According to O. Miller, "The Inventories and Valuations of the King's Goods, 1649-1651," Journal of the Walpole Society 43 (1970-1972): 258. According to N. Le Clerc and J. Colomsat, Cabinet des Singularitez D'Architecture, Peinture, Sculpture, et Graveure, Paris, 1699: 66-67. Cited by F. R. Shapley, Catalogue of the Italian Paintings, 2 vols., Washington, 1979: 1:394, as documented in the Recueil des Stampes...dans le Cabinet du Roi..., Volume I, 1763: 13. Recorded in Catalogue des Tableaux du Cabinet de M. Crozat, Baron de Thiers, Paris, 1755: 34. See A. Somof, Catalogue de la Galerie des Tableaux, Saint Petersburg, 1899: 112-113. Mellon/Mellon trust purchase date and/or date deeded to to Mellon Trust is according to Mellon collection files in NGA curatorial records and David Finley's notebook (donated to the National Gallery of Art in 1977, now in Gallery Archives). Raphael and America, National Gallery of Art, Washington, 1983, no. 77, repro. Imperial Hermitage Museum [probably Ernst von Münnich, ed.] "Catalogue raisonné des tableaux qui se trouvent dans les Galeries, Sallons et Cabinets du Palais Impérial de S. Pétersbourg, commencé en 1773 et continué jusqu’en 1785.” 3 vols. Manuscript, Fund 1, Opis’ VI-A, delo 85, Hermitage Archives, Saint Petersburg,1773-1783 (vols. 1-2), 1785 (vol. 3). Imperial Hermitage Museum [probably Ernst von Münnich, ed.]. Catalogue des tableaux qui se trouvent dans les Cabinets du Palais Impérial à Saint-Pétersbourg. Based on the 1773 manuscript catalogue. Saint Petersburg, 1774: no. 545. Wrangell, Baron Nicolas. Les Chefs-d'Oeuvre de la Galérie de Tableaux de l'Hermitage Impérial à St-Pétersbourg. London, 1909: repro. 9. Jewell, Edward Alden. "Mellon's Gift." Magazine of Art 30, no. 2 (February 1937): 82. Preliminary Catalogue of Paintings and Sculpture. National Gallery of Art, Washington, 1941: 163, no. 26. Book of Illustrations. National Gallery of Art, Washington, 1942: 239, repro. 173. Cairns, Huntington, and John Walker, eds. Masterpieces of Painting from the National Gallery of Art. New York, 1944: 46, color repro. Favorite Paintings from the National Gallery of Art Washington, D.C.. New York, 1946: 25-28, color repro. Paintings and Sculpture from the Mellon Collection. National Gallery of Art, Washington, 1949 (reprinted 1953 and 1958): 27, repro. Einstein, Lewis. Looking at Italian Pictures in the National Gallery of Art. Washington, 1951: 58-60, repro. Volpe, Carlo. "Due questioni raffaellesche. Paragone 7 no. 75 (March 1956): 12. Walker, John. National Gallery of Art, Washington. New York, 1956: 20, repro. Shapley, Fern Rusk. Later Italian Painting in the National Gallery of Art. Washington, D.C., 1960 (Booklet Number Six in Ten Schools of Painting in the National Gallery of Art, Washington, D.C.): 14, color repro. The National Gallery of Art and Its Collections. Foreword by Perry B. Cott and notes by Otto Stelzer. National Gallery of Art, Washington (undated, 1960s): 24-25, color repro. 13. Walker, John. National Gallery of Art, Washington, D.C. New York, 1963 (reprinted 1964 in French, German, and Spanish): 130, repro. Summary Catalogue of European Paintings and Sculpture. National Gallery of Art, Washington, 1965: 107. Cairns, Huntington, and John Walker, eds. A Pageant of Painting from the National Gallery of Art. 2 vols. New York, 1966: 1:124, color repro. Michener, James A. “Four Miracles—And A Masterpiece.” Reader’s Digest 89 (November 1966): 164, repro. Walton, William. "Parnassus on Potomac." Art News 65 (March 1966): 38. European Paintings and Sculpture, Illustrations. National Gallery of Art, Washington, 1968: 95, repro. Finley, David Edward. A Standard of Excellence: Andrew W. Mellon Founds the National Gallery of Art at Washington. Washington, 1973: 22, 25 repro. European Paintings: An Illustrated Summary Catalogue. National Gallery of Art, Washington, 1975: 280, repro. King, Marian. Adventures in Art: National Gallery of Art, Washington, D.C. New York, 1978: 27, pl. 6. Shapley, Fern Rusk. Catalogue of the Italian Paintings. 2 vols. Washington, 1979: I:391-394, II:pl. 279. Watson, Ross. The National Gallery of Art, Washington. New York, 1979: 35, pl. 18. Alsop, Joseph. The Rare Art Traditions: The History of Art Collecting and Its Linked Phenomena Wherever These Have Appeared. (Bollingen series 35, no. 27) New York, 1982: 452, 459, fig. 94. Ettlinger, Helen S. "The Question of St George's Garter." The Burlington Magazine 125 no. 958 (January 1983): 25-29. Shearman, John. "A Drawing for Raphael's 'St. George'." The Burlington Magazine 125 no. 958 (January 1983): 15-25, fig. 23, 24. Walker, John. National Gallery of Art, Washington. Rev. ed. New York, 1984: 170, no. 190, color repr. European Paintings: An Illustrated Catalogue. National Gallery of Art, Washington, 1985: 326, repro. Brown, David Alan. "Saint George in Raphael's Washington Painting." Studies in the History of Art 17 (1986):37-44, repro. Christensen, Carol. "Examination and Treatment of Paintings by Raphael at the National Gallery of Art." Studies in the History of Art 17 (1986):47-50, repro. Mulazzani, Germano. "Raphael and Venice: Giovanni Bellini, Dürer, and Bosch." Studies in the History of Art 17 (1986): 149-153, repro. Kopper, Philip. America's National Gallery of Art: A Gift to the Nation. New York, 1991: 91, 96, color repro. National Gallery of Art. National Gallery of Art, Washington. New York, 1992: 29, repro. Kruse, Christiane. "Eine gemalte Kunsttheorie im Johannes-Veronika-Diptychon von Hans Memling." Pantheon 54 (1996): 39-40, fig. 4. Landi, Ann. "150 Years of Helping Shape a Nation's Taste." New York Times (December 1, 1996): 46. Neverov, Oleg, and Mikhail Piotrovsky. The Hermitage: Essays on the History of the Collection, Saint Petersburg, 1997, p. 163, repro. Apostolos-Cappadona, Diane. "Beheading/Decapitation (Acheiropaiec Heads)." In Helene E. Roberts, ed. Encyclopedia of Comparative Iconography: Themes Depicted in Works of Art. 2 vols. Chicago, 1998: 1:122. Buck, Stephanie and Peter Hohenstatt. Raffeallo Santi, known as Raphael, 1483-1520. Konemann, 1998: repro. no. 25. Renaissance Culture and the Everyday. ed.Patricia Fumerton and Simon Hunt, Philadelphia, 1999: 47-50, repro. Belozerskaya, Marina. Rethinking the Renaissance: Burgundian Arts Across Europe. Cambridge, 2002: 269-270, fig. 87. Hand, John Oliver. National Gallery of Art: Master Paintings from the Collection. Washington and New York, 2004: 78-79, no. 55, color repro. Hartt, Frederick, and David G. Wilkins. History of Italian Renaissance Art: Painting, Sculpture, Architecture. 6th ed. Upper Saddle River, 2006: 479, 481, color fig. 16.42. Odom, Anne, and Wendy R. Salmond, eds. Treasures into Tractors: The Selling of Russia's Cultural Heritage, 1918-1938. Washington, 2009: 91, 131, 135 nt. 62. Fiedler, Susanne, and Torsten Knuth. "Vexierbilder einer Biographie: Dr. Heinz Mansfeld (1899-1959)." Mecklenburgische Jahrbücher 126 (2011):308. Haskell, Francis. The King's Pictures: The Formation and Dispersal of the Collections of Charles I and His Courtiers. Edited by Karen Serres. New Haven and London, 2013: 47, fig. 57, 181 n. 16, 227. Hodge, Susie. Raphael: His Life and Works in 500 Images. Wigston, Leicestershire, 2013: 137, color figs. Jaques, Susan. The Empress of Art: Catherine the Great and the Transformation of Russia. New York, 2016: 397, 398, color fig. Warner-Johnson, Tim, and Jeremy Howard, eds. Colnaghi: Past, Present and Future: An Anthology. London, 2016: 64-65, color plate 9. Wecker, Menachem. "Famed Arts Patron Catherine the Great had Many Lovers, But She was a Prude." Washington Post 139, no. 120 (April 3, 2016): E2, repro.